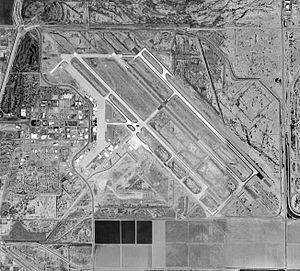 Williams Air Force Base, now known as Phoenix-Mesa Gateway Airport, sits on about 4,000 acres of land in Mesa, AZ. Williams AFB was established on July 16, 1941 and used for training fighter pilots. It was named after Charles Linton Williams, who was born in Arizona and a pilot. Over 26,500 men and women passed through the base and earned their wings. Williams AFB could boast having the most student pilots to graduate from their facility. In 1993, Williams AFB had to close causing many to lose their jobs and millions of dollars lost in annual financial profits. Plans were immediate to revamped and redesign the base into a useable space. It is now an airport where many smaller and private planes are docked. One of the buildings located on the far west side of the base was used as the hospital. Today it is the VA hospital and has reports of it being haunted. There have been several claims of a male ghost seen in the area once used for viewing newborns. This male ghost has also been seen wandering around the old operating rooms. Some have said while in the old Officers Club they have heard disembodied voices. It sounds like another place for us ladies to investigate, along with our POE team. I used to get my health care as a teen and young adult at that hospital and I will tell you that it was there I saw my first shadow person in my sister's room after she delivered her child. We always went there together. The place gave us the creeps. It had a very weird feel to it. Very unsettled. I've worked in hospitals and spent time in a lot of them and this was one of only two I ever felt was haunted. The other one was in Mesa. I would be great if we can check out the place and do a ghost hunt. I love creepy hospitals. Dr's @ Williams saved my life @ about age 7...I remember Nurse Billie taking me outside to watch the jets fly over in the air show. I was born on Williams! Would love to hear more if you ever made it there to investigate! I was stationed at Williams Air Force Base from 1976 to 1980. My second son was born at that hospital on September 1st 1981. I never experienced any strange occurrences are ghosts while I was there. It was a wonderful experience and a beautiful base.